If you’re more of a casual gamer, Crazy Market from The Game Atelier, is right up your street (or aisle!). This game sees you taking the role of Lulu in one of the biggest supermarkets in town. Your job? To clear the conveyor belt as quickly as possible, while looking out for threats and the customer’s forgotten valuables (like babies!). There are over 100 levels available, with 12 boosters and upgrades to help you ace each level. Naturally, the boosters and upgrades cost “coins”, which can be earned via gameplay, or purchased for real money via the PlayStation Store. Playing well will net you rewards, and boosters, without the need to pay for them. And if you’re a trophy hunter, the game has 11 trophies you can unlock through gameplay. An exclusive app for PS Vita, Frobisher Says! is a collection of crazy mini-games, devised deep within the eccentric mind of Frobisher himself. Some of the min-games are pretty easy, while others are rather frustrating. 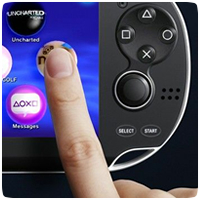 To be successful, you’ll need to make use of the full range of features your PS Vita has to offer. Tickle the touchscreen, wiggle the analogue sticks, shout into the microphone – who knows what you’ll need to do? Whatever it is, you need to be quick, as the faster you can complete each challenge, the more points you’ll get before the next task begins. There are 25 mini-games available from the start, and more unlock as you play. You can also purchase two add-on packs from the PlayStation Store, which add further mini-games. It’s a shame that there isn’t a Casino Spelautomater type game in this collection, but there is plenty of variety around nonetheless. From the company that bought you LittleBigPlanet for the PlayStation comes the cute Sackboy game. This simple to play fantasy platform game sees Sackboy running around the in-game world, while the nasty Negativitron nips at his heels. You can collect chains of bubbles, find exciting power-ups and unlock new costumes. The bubbles you collect can then be used to purchase new items and Save Me hearts for extra lives. Through the game, you can also collect stickers to unlock exclusive costumes for Sackboy to wear in LBP2, LBP3, LBP Karting, and LBP PS Vita, and costumes for Sackboy, OddSock, Toggle and Swoop in LBP3 on PS3 and PS4. Table Soccer was one of the first Augmented Reality (AR) games for the PS Vita, and a launch title when the portable console released in North America and Europe. You’ll need AR Cards to enjoy this game on the PS Vita, which can be printed if you don’t have the original ones that came with the PS Vita. Table Soccer allows you to create your own soccer stadium and enjoy this beautiful game on any flat surface. You can take part in tournaments, play exhibition matches, or play against a friend using ad-hoc connectivity.